The LPMMC was founded in 1990 by Roger Maynard, professor of condensed matter theory at the University Joseph Fourier of Grenoble, and Alain Pasturel, research professor of chemical physics with CNRS. In its original form, under the original name of “experimentation numérique”, the “équipe postulante” of Grenoble University was given two vocations. First, this new laboratory should start a new way of doing physics, intermediate between theory and experiments, and facilitated by the new generation of rapid computers. Secondly, by housing it at the newly created Maison des Magistères on the CNRS campus “Louis Néel”, together with the “Ecole Doctorale de Physique” of the University, the laboratory would be the first pied-à-terre of the University on the CNRS Campus. The omnipresence of computers in all scientific research has obliged us to insist more on the physics under study. The name was changed into “Laboratoire de Physique et Modélisation des Milieux Condensés” (LPMMC). In 1998, the laboratory became officially recognized as an Unité Mixte de Recherche, with as major partners the University of Grenoble and the national CNRS. The laboratory attracted many young researchers finding jobs at either CNRS or University of Grenoble. In 2007 two teams exist : Waves in Complex Media, Mesoscopic Theory. Many different subjects are now under study : qubits, nano-mechanics, random lasers, Anderson localization, Kondo effect, renormalization theory, the mesoscopic physics of optics and acoustics, cold atoms, seismology and telecommunication to mention a few. 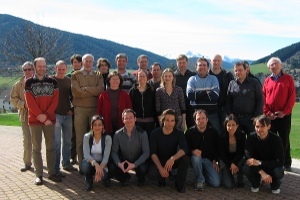 The different members at LPMMC – coming from no less than 10 different countries - are theoreticians that work closely with experimental teams in Grenoble, in France, and all over the world. During the contract 2003-2006, the LPMMC produced 125 peer reviewed papers, among which 36 Letters. Altogether 148 invited conferences or seminars were delivered all over the world. The LPMMC plays a leading role in different local, national and international projects. On a local level we mention the newly created Grenoble Center for Theoretical Physics (CTPG), the meso-informatic project PHYNUM, and the close contacts with the newly created Institut Néel. The laboratory is deeply implicated in the two national research groups IMCODE and Physique Mésoscopique Quantique. Supported collaborations exist with many countries in Europe and all over the world.